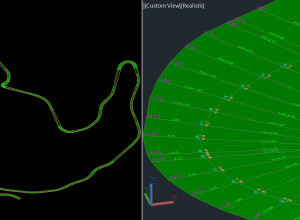 P3D: creates 3D axis and roadside, starting from 2D. 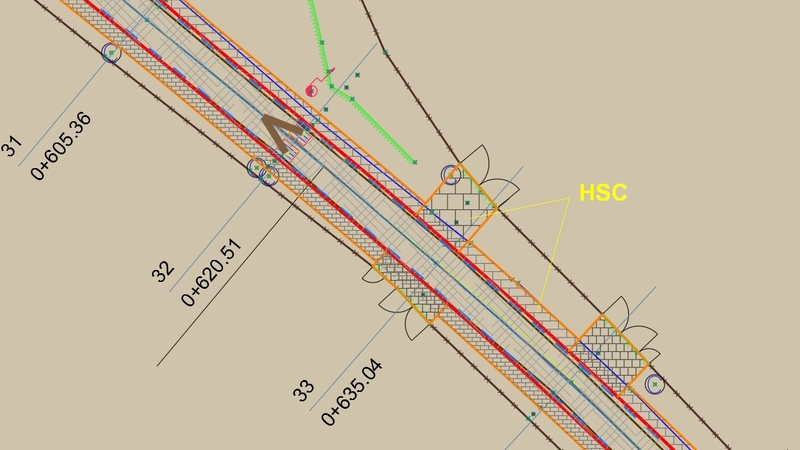 We also have other new commands in AutoCAD or BricsCAD that you can buy separately: 3D intersection of two sets of 3DSOLID, 3DMESH and 3DFACE, developed (unfolded) section of 3DSOLID, 3DMESH and 3DFACE, triangulation, isolines, contour lines, volume (of soil excavation, for example), loading XYZ points files, flatness of the surfaces, cross sections, longitudinal profile, drawing DWG in Google Earth, identification of wooden beams from 3D drawings of wooden houses and design of furniture. 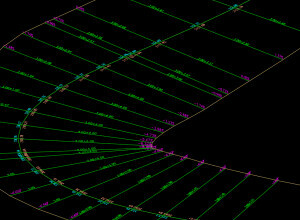 P3D generates the 3D axis, the edges and the surface of a road, starting from 2D POLYLINE from a DWG. – the right edge distance of the road. 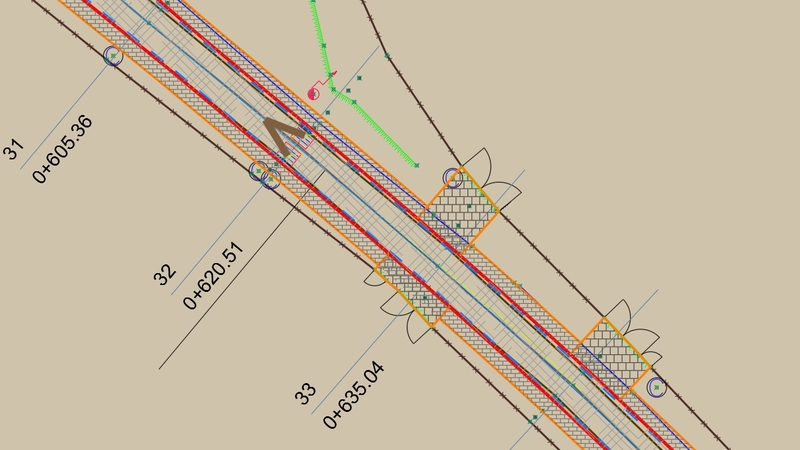 Optionally, you can create 3 input files with the same name as the DWG file: for transversal slopes, with right extra widening and with left extra widening. It will be generated three 3D POLYLINE corresponding to the road axis and to the left and right margins. 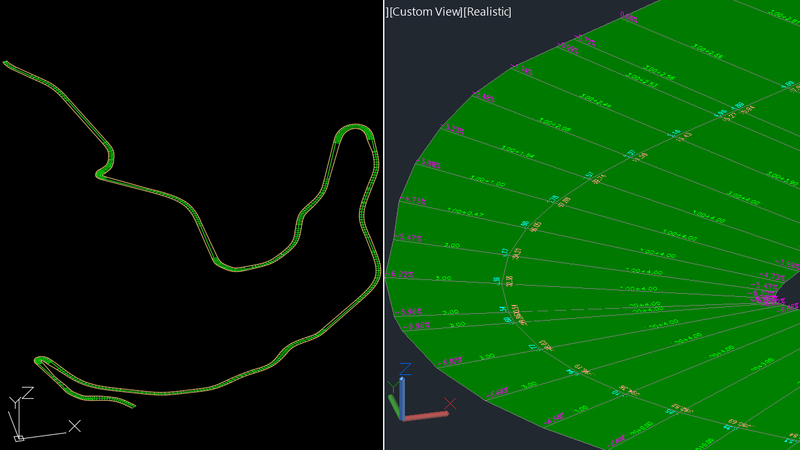 It also generates 3DFACE entities representing the surface of the road and some texts are written: accumulated distance (“s”), Z coordinate of the axis, distances to the edges and transversal slopes. KMP will update the mileage in the form of attributes in BLOCK entities inserted on a POLYLINE or LWPOLYLINE. 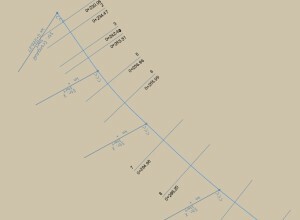 First you must select a POLYLINE or LWPOLYLINE. Then you will select an initial BLOCK that must have the attributes KM and M. The value in KM will be the part in kilometers of the initial kilometer and the value in M will be the part in meters. 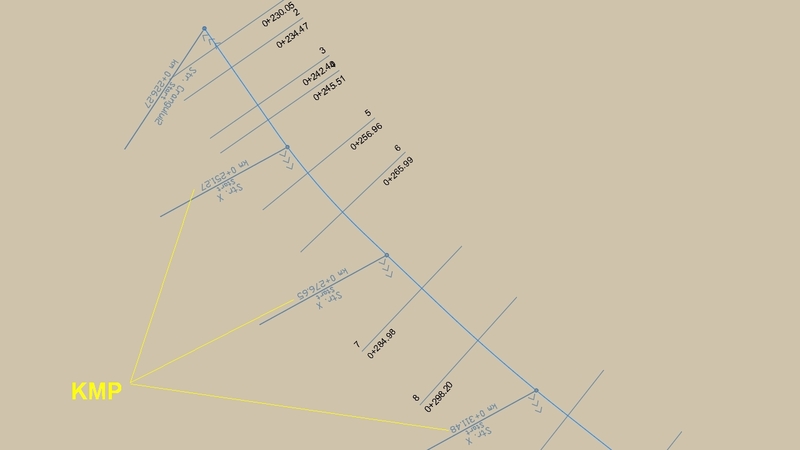 The KMP command will look for the BLOCKs that are inserted on the POLYLINE that you have selected and have KM and M attributes. 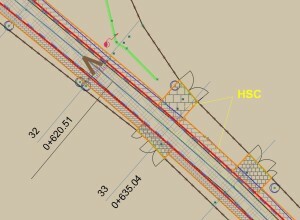 Their attributes will be completed with mileage, based on the POLYLINE distance between the initial BLOCK insertion point and the current BLOCK insertion point. 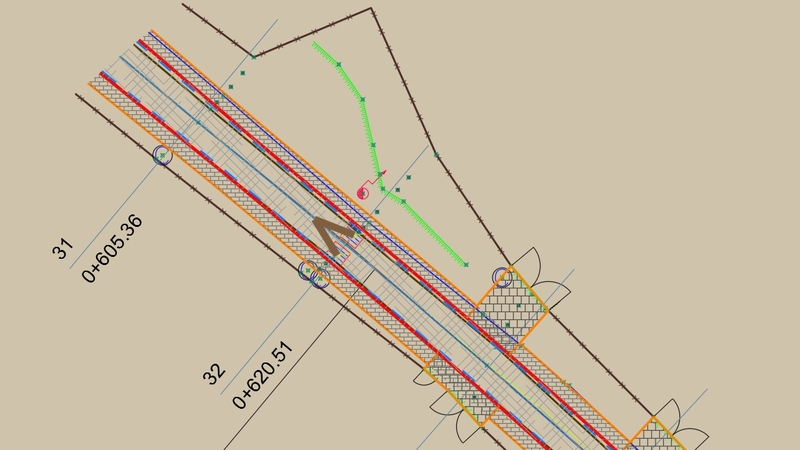 The command is useful when you have many BLOCKs that identify culverts, manholes, etc., for which you have to enter the mileage from an initial kilometer. 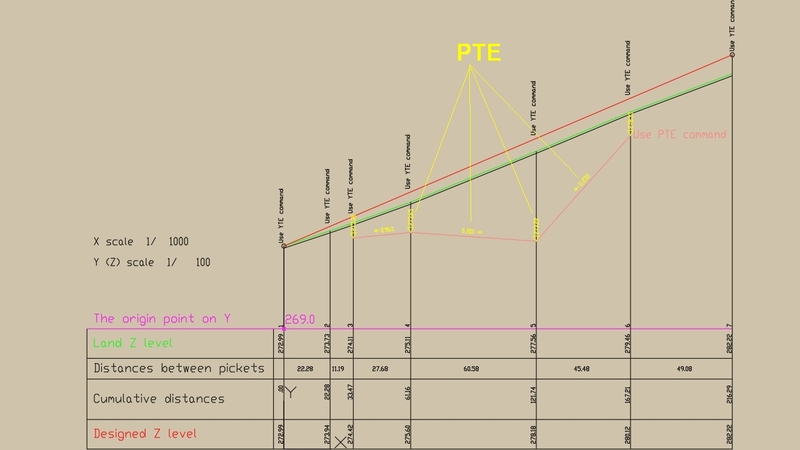 PTE enters the Y elevation and the slope of the segments between the vertices of a selected POLYLINE or LWPOLYLINE. 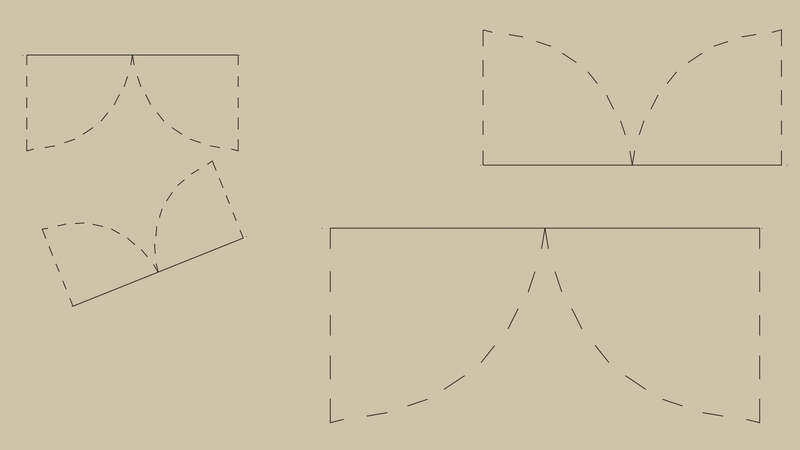 – POLYLINE or LWPOLYLINE entities will be repeatedly selected. 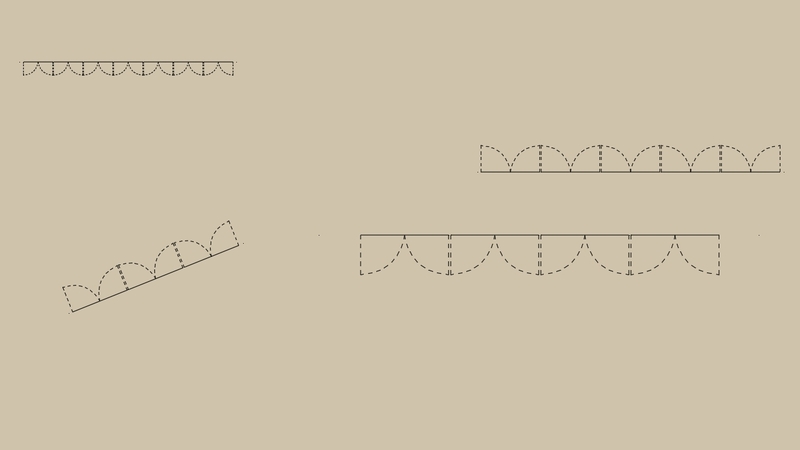 At the POLYLINE vertices a triangle with its Y value will be inserted, and the slope and the flow direction will be entered between the vertices. 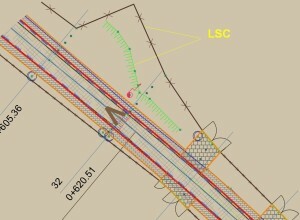 An example of use is a POLYLINE introduced into a longitudinal profile, representing the ditch bottom line. 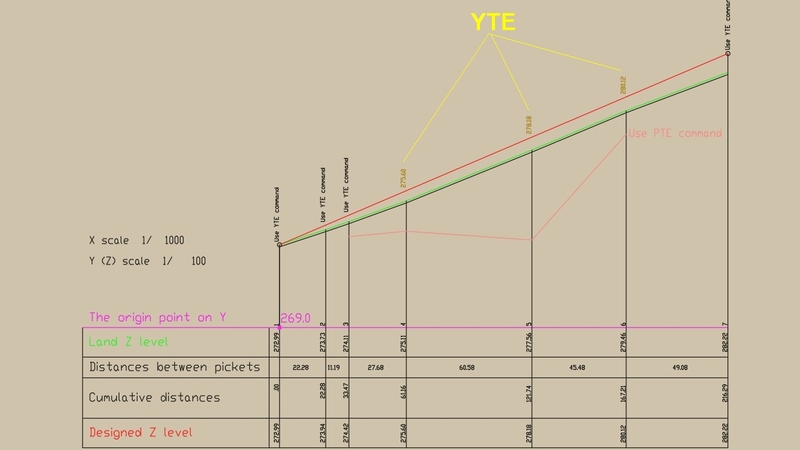 With YTE you can modify the Y coordinate enrolled in a TEXT entity, depending on the Y coordinate of an indicated point and an initial Y. 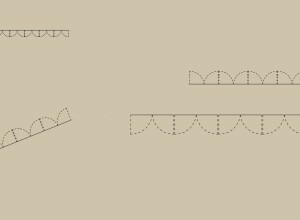 First you will indicate the scale on Y of the drawing. 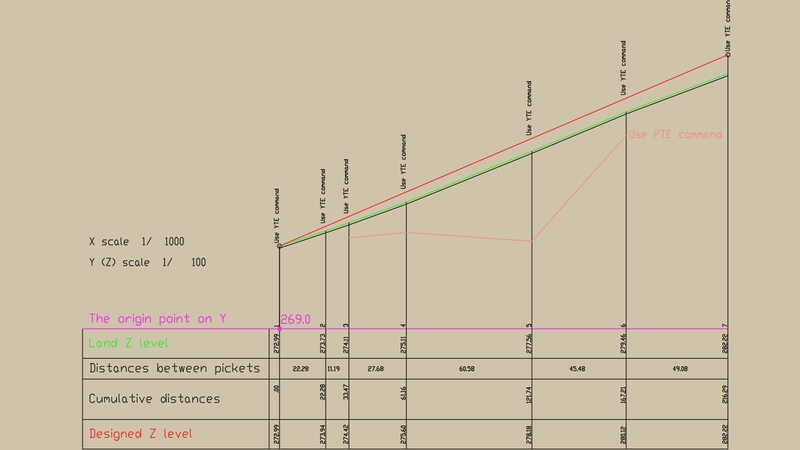 Then you will indicate a point relative to which the Y points will be corrected. 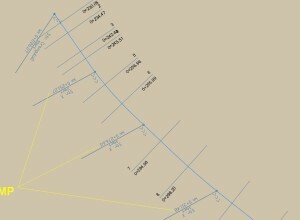 A TEXT entity will then be selected, representing the real value of the Y coordinate of the origin point indicated above. Also indicate the number of decimal places for the Y value to be enrolled. 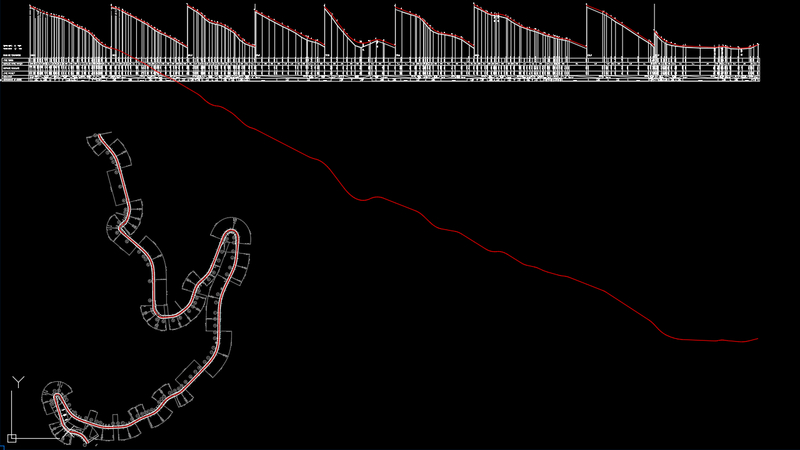 Then, repeatedly, one point (possibly with OSNAP options) and a TEXT entity will be indicated. 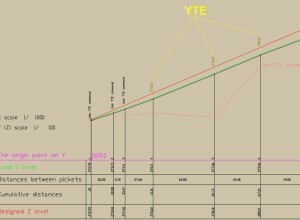 The TEXT will automatically change to represent the Y coordinate of the indicated point relative to the origin point and the Y scale. 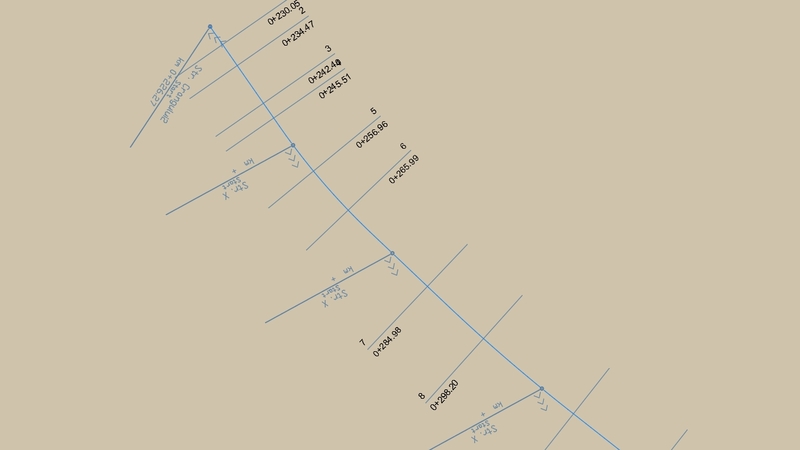 The command is useful to adjust the Y values to an origin point, for example, from drawings representing sections or longitudinal profiles. 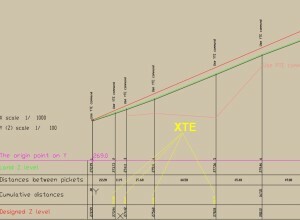 With XTE, you repeatedly modify the TEXT entities that represent the X coordinate of an indicated point. 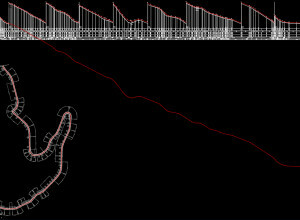 First you will point the X scale of the drawing. Also indicate the number of decimal places for the X value to be enrolled. 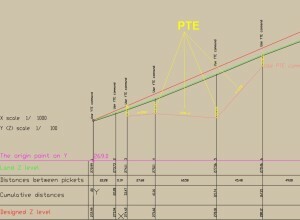 Then, repeatedly, one point and a TEXT entity will be indicated. 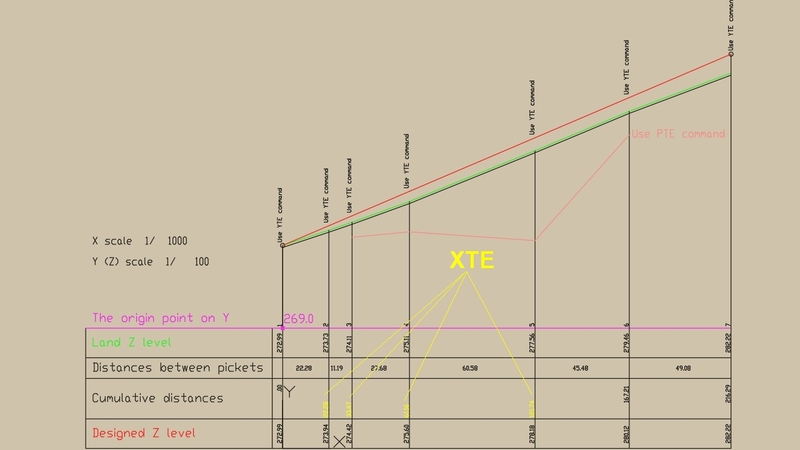 The TEXT entity will change to the value of the X coordinate of the point, relative to the origin of the current UCS. 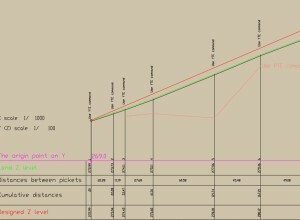 An example where you can use the command is the row of accumulated distances from a longitudinal profile. 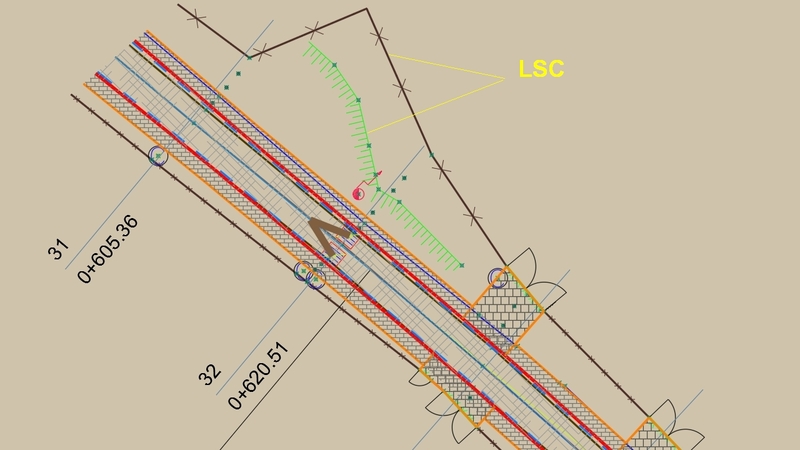 In this case, change first the UCS in the first point from which the distances are gathered. 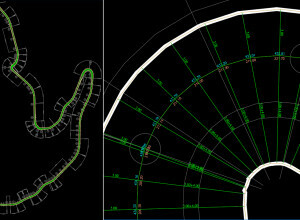 Multiplies with a user-specified number LINETYPE scales for selected entities. 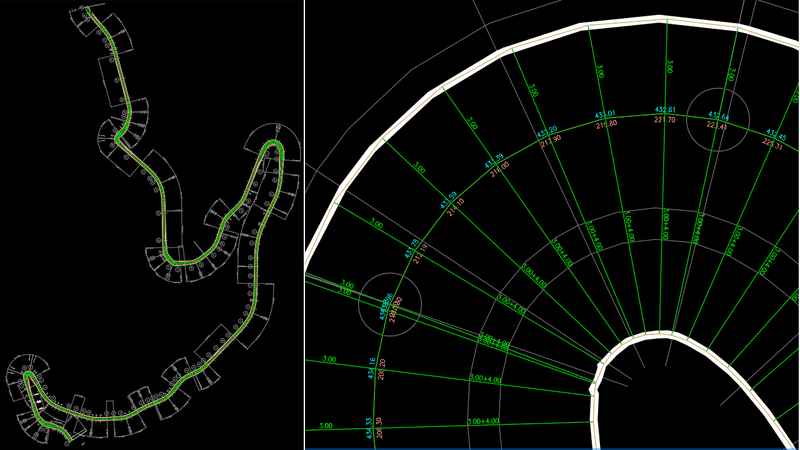 It is useful when you do not want to change the LINETYPE scales for all entities in the drawing (with the AutoCAD LTSCALE command), but you want a change for only a few entities. Multiplies with a user-specified number, the scales of the HATCH entities, from the set of selected entities. 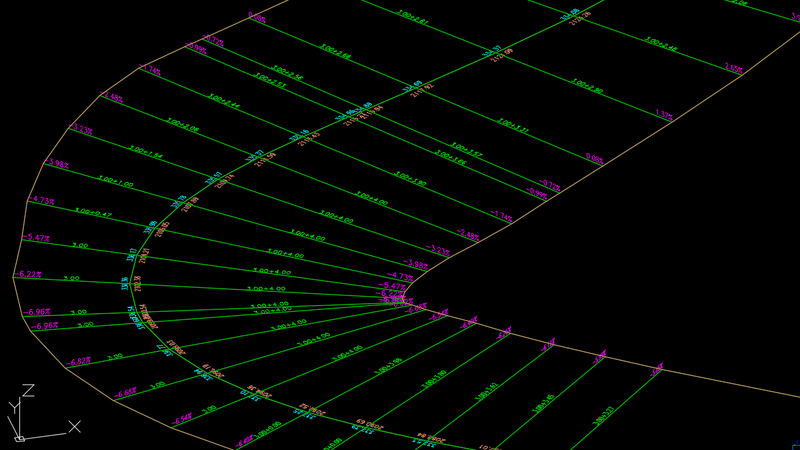 Adjusts the scale of selected LINE entities that have the LINETYPE with SHAPE. The scale will have a value equal to the length of the LINE entity! 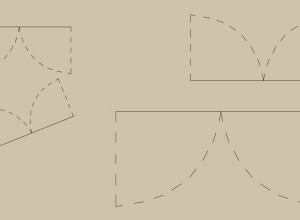 The command is useful when you have LINETYPE with SHAPE and you want SHAPE to cover the entire LINE length (for example a SHAPE for a gate or for a window). Requirements: AUTOCAD version 2010 to 2019.